WORDS ON THE LINE by Philip Vassallo: BOOK BRIEF: Want to Write a Book? Here's How! BOOK BRIEF: Want to Write a Book? Here's How! The most established writers I have met say the best way to finish a book is simply to get started writing it. Commonsense, right? Therein lies the difference between those who aimlessly fantasize about completing a book and those who make an honest effort at doing so, those who make endless excuses about why they can’t move forward and those who face the task with dogged determination, those who duck the due diligence that comes with struggling through the detail and those who work relentlessly at it. Would-be writers clearly outnumber their successful counterparts. Dan Janal suggests a prime reason is not unrealistic expectations or linguistic laziness, but self-defeating attitudes. To counter negative approaches to authorship, Janal includes an unusual element in his 10-step book-writing process: overcome limiting beliefs. He wisely realizes that novices need encouragement to follow through on their publishing goals, to ignore their naysaying critics, and to get over their worst selves. Janal writes productively and he wants you to. 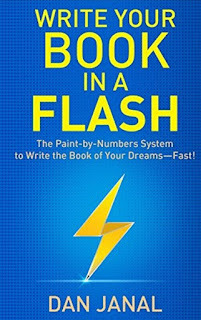 Write Your Book in a Flash is a systematic, readable book full of practical tips and encouragement for aspiring authors. Janal lays down numerous tips in each chapter. He starts with what he calls five levels of book authority, from easy to complex, proving immediately that new writers probably already have the seeds of their first book. He drills deeply into each of his 10 steps with templates that make short work of positioning statements, audience analysis, pitch letters, and review requests—all crucial parts of rendering a publishable book. His DESCRIBERS mnemonic provides clear guidance for adding flesh and blood to a skeletal book outline. Plenty of books promise to make their readers better writers. Janal assumes we already are—if only we got moving. Write Your Book in a Flash offers worthwhile tools to do so in the current publishing world.